After my two wonderful meals at Odette by Julien Royer, who was the ex-excutive chef at JAAN, my curiosity of the current JAAN raised. My last visit was still one year ago when Julien was still there, at that time JAAN was ranked No.11 of Asia's 50 Best Restaurants. Although the ranking dropped to No.29, i have heard great things happened there. Currently helming by Chef Kirk Westaway, who is directed to inherit JAAN’s philosophy to serve innovative cuisine by using nature’s best ingredients. Chef Kirk grew up in a small seaside town in Devon on the Southwest coast of England where is famous for its impeccable produce and incredible variety of products. Kirk wish to bring the nature's perfection by his talent hands. 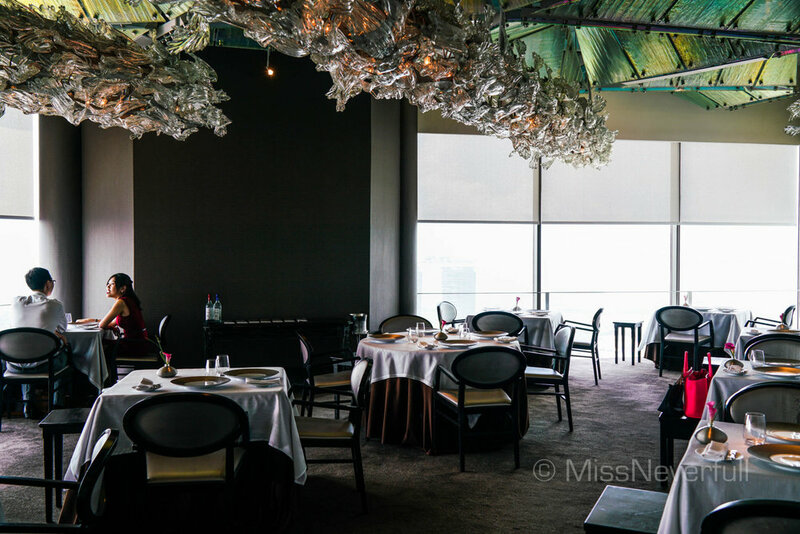 JAAN located on 70F of Swissôtel The Stamford Hotel, right next to the Equinox restaurant which has a breath-taking view of the Marina Bay and CBD area. 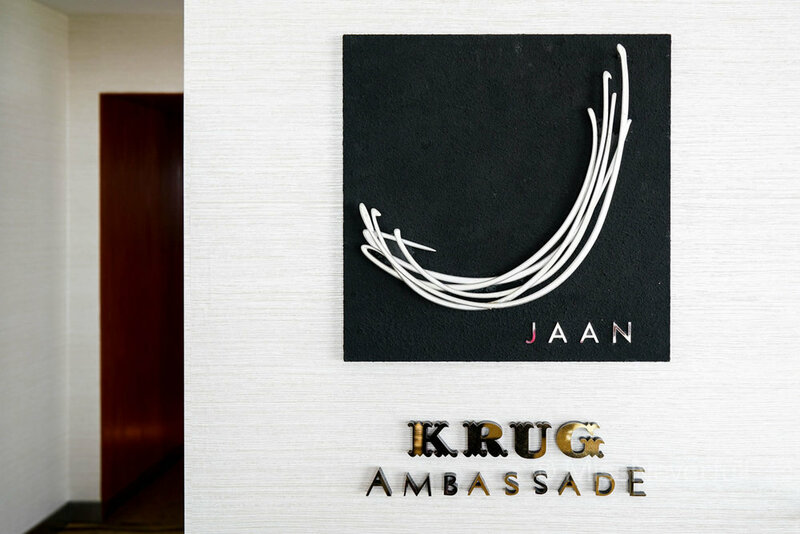 This year, JANN is also directed as the Krug Ambassade by serving a menu with Krug pairing too. JAAN's lunch menu is reasonably priced at $78++ for 3 courses include amuse bouche, petit four and coffee. If you wish you try more dishes, get the $118 menu for 5 courses (vegetarian menu is available at the same cost). For a complete experience, try the 7-course tasting menu ($158). Dinner menu are priced at $198, $238, and $298 for 5, 7, and 10 dishes respectively. Firstly arrived four snacks, the tart and the rice cracker have bursts of savoury tastes, fish & chips (top right) is interesting but cannot compete Andre's, truffle mushroom was aromatic but unfortunately stuck on my teeth. Mushroom tea with cep mushroom, smoked potato and black truffle, a classical one that shouldn't be missed. The clear mushroom broth has a depth of flavours and the emulsion on the top was airy and delicious. JAAN serves one of my favourite breads in the city, this time bread service includes sourdough, baguette, walnut&raisin bread and lemon brioche. I loved their truffle brioche but it is not available any more as the left of Julien. I tried the sourdough which was quite dense for my liking, in comparison, the walnut and raisin bread has a softer inside with a bit crunchy and sweetness tastes better. Our first dish was heirloom tomato with basil sorbet, burrata cheese and basil pesto. The tomato itself was cooked sous vide in tomato broth to enhance its sour and refreshing flavours. It was stuffed with a mixture of Oxheart tomatoes, capers, oregano and gherkins, which tastes like gazpacho. I was really impressed by its perfect original shape and pure tomato flavours. Classical dishes like degree organic hen's egg was still kept on the menu. 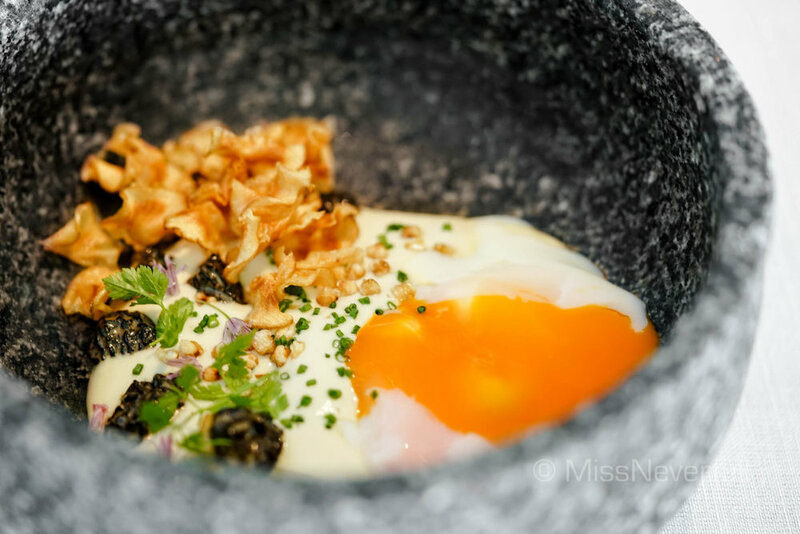 Alongside the organic egg cooked sous vide at 55 degrees, a bowl of morsel mushroom, and some crunchy chips and buckwheat was served to enjoy together with the perfectly poached egg. The textures were wonderful - incredibly creamy with crunchiness. The flavour was flawless while i found it lack of surprises after visiting JAAN for several times as well as Julien's Odette recently. Confit Brittany cod has wonderful textures however nothing remarkable on the flavour side. For the next main dish, my partner enjoyed his Canon of Lamb with Bagna cauda very much. My roasted forest pigeon was also delicious. The meat was perfectly roasted, i really loved its slightly crispy skin with succulent meat underneath. Since i also had a 85% similar pigeon dish at Odette, this one didn't surprised me neither since Odette's was honestly wins over. Cheese course was priced at $20 as a supplement. It is hard to say 'no' to black truffle as it was in season, let alone the mouth-watering description of black truffle brie with black truffle ice cream. This was the best cheese/brie i recently had, the sandwiched mushroom and truffle has a depth of flavours which works perfectly with the black truffle ice cream - too was the most impressive black truffle ice cream so far. We had a pretty glass of grapefruit server with lime espuma before the main dessert arrived. It was pretty refreshing. I really enjoyed the new dessert on the menu - Gariguette strawberry, vanilla parfait and spiced sorbet. The vanilla parfait was creamy and paired well with the juicy strawberries. Some soft and airy sandwiched sponge cake as well as a crispy rolled chip were added to the dish to give more textures. The spiced sorbet was very interesting and works harmony with the rest part. To wrap up, we were treated completely coffee service as well as petit fours. Chef Kirk again came to our table and induces the three-layered petit box, featuring crunchy chocolate ball filled with caramel, lemon tart and homemade cookies. All three snacks were beautifully done. Obviously Chef Kirk is well-inheriting JAAN's philosophy, which is to serve French cuisine with a modern twist. 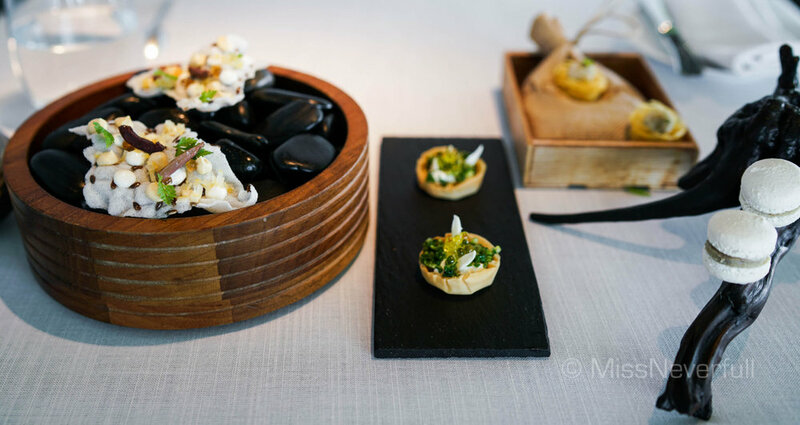 Each dish was beautifully-plated and the flavours was well-balanced. I really appreciated Chef Kirk's creations, while to be honest, the meal was lacking some surprises and overall, not impressive as my previous visit when Julien was still there.